Yesterday, a delegation of CIW Women’s Group members and their children delivered a very different sort of Thanksgiving message to Publix. “… We will no longer be victims of silence. Our ideas are rooted in the changes that are now occurring in the fields of Immokalee. It is just to support a dignified life for our children and a raise of just one more cent for farmworkers. Over the years we have formed the base of the family. And although our voices have not been heard, we have not lost our faith that change will come. Now the new Fair Food Code of Conduct that is being implemented allows for an end to unequal treatment based on gender as well as an end to the labor abuses that have been common in the fields. Many of these abuses affect us uniquely as women, and that is why today we ask Publix for its support. 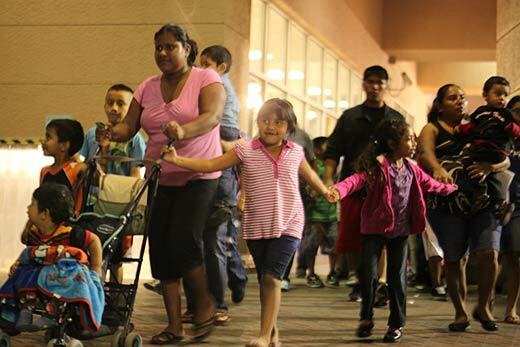 … Publix: Hear our cry for justice. We want fair wages. We want the implementation of basic rights for farmworkers and our families. As mothers we would like to be able to provide an adequate Thanksgiving-Day meal for our children, earned with our own sweat, and not to have to wait in line this Thanksgiving and depend on charity and handouts. Today we end our traditional silence and publicly express our reasons and feelings. 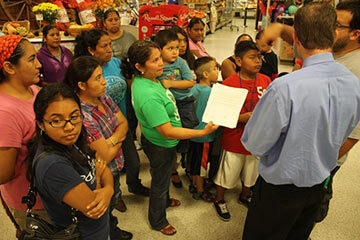 Please take a few moments over the next couple of days to read their letter and consider how you, too, might make your voice heard in the effort to soften the hearts of the men and women who run Florida’s $25-billion grocery giant and refuse to even meet with workers from Immokalee to discuss the widely-acclaimed Fair Food Program. As we approach Thanksgiving and religious congregations across the nation pause to give thanks for a bountiful harvest and human community, we are reminded that, in the most basic and essential aspects of our life together, food and work, members of our society are interconnected. Our choices and actions impact one another, and we have both the power and the responsibility to create economic systems that promote and protect human well-being. The Coalition of Immokalee Workers’ fair food agreements with nine major food buyers and over 90 percent of Florida tomato growers, are improving poverty wages and overcoming generations of human rights abuses faced by farmworkers in the fields. But this harvest will only be bountiful if Trader Joe’s shares in cultivating it. As people of faith we give thanks to God for the first fruits of this new harvest of human rights. And we take this opportunity to encourage Trader Joe’s to sign a fair food agreement with the Coalition of Immokalee Workers. Please help bring about a harvest that is both abundant and just. We hope you and yours have a wonderful and peaceful Thanksgiving holiday.